Many of the poems in National Monuments explore bodies, particularly the bodies of indigenous women worldwide, as monuments—in life, in photos, in graves, in traveling exhibitions, and in plastic representations at the airport. Erdrich sometimes imagines what ancient bones would say if they could speak. Her poems remind us that we make monuments out of what remains—monuments are actually our own imaginings of the meaning or significance of things that are, in themselves, silent. As Erdrich moves from the expectedly "poetic" to the voice of a newspaper headline or popular culture, we are jarred into wondering how we make our own meanings when the present is so immediately confronted by the past (or vice versa). The language of the scientists that Erdrich sometimes quotes in epigraphs seems reductive in comparison to the richness of tone and meaning that these poems—filled with puns, allusions, and wordplay—provide. Erdrich's poetry is literary in the best sense of the word, infused with an awareness of the poetic canon. Her revisions of and replies to poems by William Carlos Williams, Robert Frost, and others offer an indigenous perspective quite different from the monuments of American literature they address. 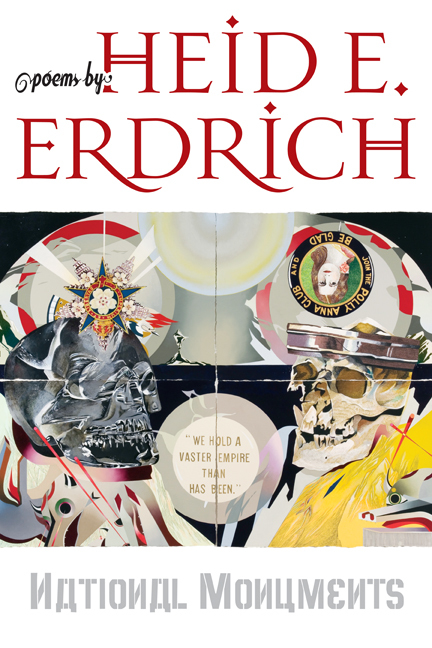 "Erdrich's poems are beautiful and brave explorations of the depths of national identities and the realm people who live them...these are poems I loved reading."